The V-R185-DLW features an In-Monitor Display (IMD) with the ability to display on-screen text and tally in three colors. IMD text, color, and alignment can be assigned to each screen locally using menu options. Alternately, IMD text and tally can be remotely controlled via the RS-422/485 serial interface using several industrystandard protocols, including TSL v4.0 and Image Video. Multiple V-R185-DLW monitors can be looped together and each addressed individually via the protocol. All menu features of the V-R185-DLW can also be controlled via the Marshall Network Controller box using MEI protocol. 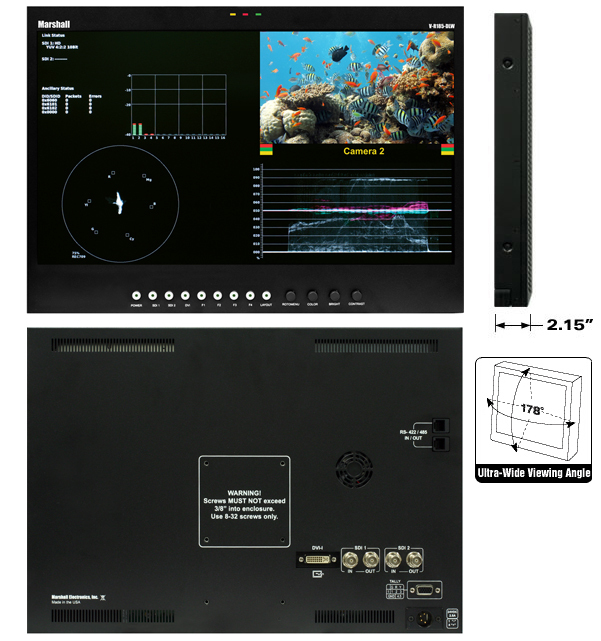 The 18.5" V-R185-DLW monitor includes Dual Link with Waveform & Vectorscope, along with IMD (In-Monitor Display). The V-R185-DLW incorporate a 10-bit "no compromise" video path along with one of the industry's first monitors equipped with 3G capability. 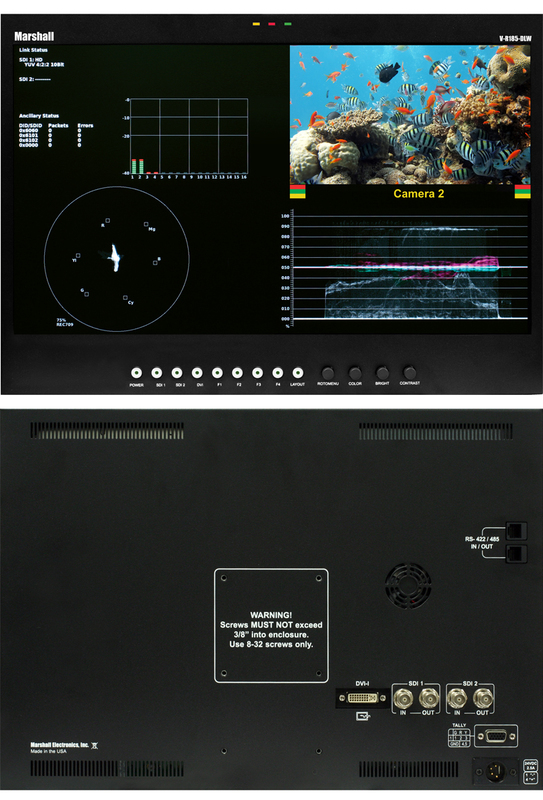 In Quad-View mode, the monitors break the screen into four quadrants and display Audio Bars, a Waveform Monitor, Vectorscope, and live video simultaneously. All models have two inputs supporting 3G / HD / SDI and Dual Link. A DVI input supports all HDMI modes and DVI to 170MHz. Additional features include IMD protocol support for TSL, NVISION, Image Video, and MEI (Marshall Electronics) tally control systems, remote firmware update via RS-485, tri-color hard and soft tally, and Safety Marker configurations. Other display features include full CEA-608-B and CEA-708-B Closed Captioning. The V-R185-DLW features an all-digital 1366x768 LED-Backlit display. The LCD panel features a brightness of 300 cd/m² and a 1000:1 contrast ratio making it ideal in a variety of environments and lighting conditions. The DLW monitor series includes a real-time Waveform monitor and Vectorscope along with support for SDI, HD-SDI, 3G-SDI and Dual Link SDI. With the monitor in Multi mode, the monitor will break into four quadrants and display Signal Input information (Link Status), Embedded Audio levels, a Waveform monitor, a Vectorscope and live video simultaneously. Additional layouts provide the ability to view the Waveform monitor, Vectorscope, SDI Link status and Video individually. The DLW monitor allows for decoding of Closed Captioning in the EIA-608 or EIA-708. In-Monitor Display allows on-screen text and tally indication, controlled locally or remotely via a variety of industry standard protocols. Embedded time code and an embedded audio presence indicator can be displayed on the screen in a variety of configurations. Closed Caption presence indication is also provided for 608/708 captions. Color temperature adjustment, aspect ratio settings, blue-only mode, and monochrome mode are a few of the advanced features allowing the V-R185-DLW to be at home in any broadcast environment. Pixel-to-Pixel mode also allows native display of any incoming image format. Four user-definable function buttons allow quick access to numerous settings and features including aspect ratio, monochrome mode, color temperature, and more. The built-in waveform monitor can be displayed in various aspect ratios, positions, and transparency options. The waveform monitor displays YUV/RGB in both Overlay and Parade modes. The built-in Vectorscope allows users to monitor color gamut range in real time. It displays in various sizes, positions, and transparency options. 2 x 3G-SDI inputs with loop-through and SD-SDI, HD-SDI, & 3G-SDI support.